Miranda Wilson is a cello professor at the Lionel Hampton School of Music, University of Idaho. Originally from New Zealand, she has performed as a soloist and chamber musician on five continents. Her most recent compact disc recording, Wondrous Love: Works for Solo Cello, featuring solo cello works by Ernest Bloch and Daniel Bukvich, was released by Albany Records in 2014. She also appeared on the world première recording of Sofia Gubaidulina’s Quaternion (Chandos). Dr. Wilson is a nationally regarded string pedagogue, having published many articles in journals such as Strings and American Music Teacher. Her first book, Cello Practice, Cello Performance, will be published by Scarecrow Press in 2015. She is the founder and Director of Strings of the Lionel Hampton School of Music Preparatory Division. Previously, Dr. Wilson was a founding member of the Tasman String Quartet, which toured internationally, winning top prizes in chamber music contests including the Plowman, Rutenberg, and Asia-Pacific competitions. The TSQ held a two-year residency at the University of Colorado as assistants to the Takács Quartet, and further residencies at the Aspen Music Festival and School, the Banff Centre for the Arts, Auburn University, and the University of Illinois. 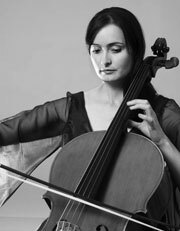 Dr. Wilson made her soloist début at 16, playing Elgar’s Cello Concerto with the Orchestra Wellington. She holds degrees from the Universities of Canterbury, London, and Texas. Her teachers were Rolf Gjelsten, Natalia Pavlutskaya, Alexander Ivashkin, Phyllis Young, András Fejér, and Judith Glyde.